There is a good chance that a compelling story won’t be enough to get you everything you need and if you have the data then you should be able to pull together the value of community engagement in order to establish a base line of opportunity. If you don’t have that don’t let it stop you! Getting funding for social business initiatives is never easy and until you can associate revenue to your initiative it is very hard to secure incremental investment to further your programs. Linking your social engagement activity to booked revenue in order to come up with a measurable ROI and justification is the best way to get the attention needed to have a funding conversation. Welcome to the wonderful world of big data analytics. You don’t have to be a data scientist but knowing statistical information to back up your engagement strategy will work toward your advantage to secure executive support and funding. In order to make this ROI association my team went through the exercise of pulling new community registrants for a given year then matched them to booked revenue over that same period. Once this list is compiled, the average purchase price of those companies who had members in the community can be compared to those companies who did not have members. The data in this example concluded that customers with members in a community had an average purchase price 240% higher than those customers who were not engaged in the community. This was all I needed to get the attention I needed and it wasn’t even the most compelling statistic. What we further determined was if we could increase the number of companies engaging in the community by just 1% we could increase revenue by $12M. But considering there were over 12,000 companies listed as customers that growth opportunity had the potential to be upwards of 2500%. Now we were talking Billions and those types of numbers catch executive’s attention. 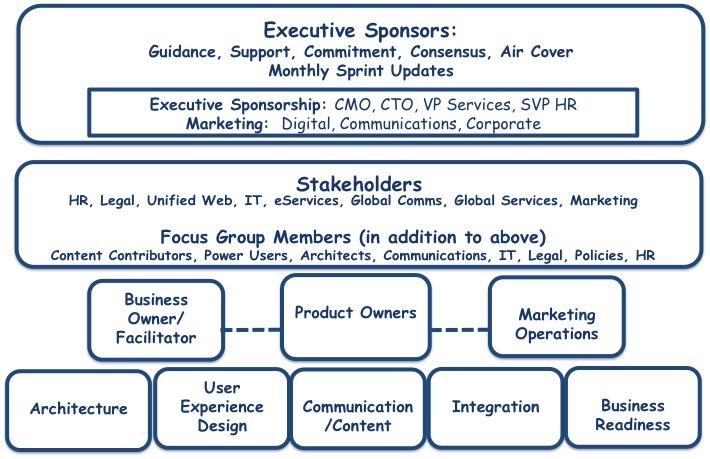 About a year ago I started outlining a book on community collaboration and digital marketing strategies. I started covering all the basics, SEO, content publishing, advocacy, social media and engagement etiquette. And I realized toward the end that most of my success implementing these strategies for companies was due to executive leadership. Any project starts with leadership to help get the support you need from executive sponsors to improve your teams chances at success. This may be the most important aspect of any rolling out any marketing engagement program for three reasons: Obtaining funding, removing obstacles, and team motivation. First of all if you don’t have funding you don’t have a project. Securing commitment for funding reassures the team that there is support for there efforts. It provides the resources, new hires, products needed to get the ball rolling. Funding is also one of the bigger obstacles that will need to be addressed immediately but not the same as other obstacles you will face when rolling out a disruptive technology. The other types of obstacles I am referring to are political. You would be surprised how many internally and externally want a voice but don’t want to help. You will find between finance, HR, global security, legal, IT… etc… there will be no shortage of departments that will want to slow things down by asking questions, throwing up barriers and all around objection to change. No one likes change but it is necessary if you want to evolve and survive in this new modern world of customer engagement. Getting a good representation of executives will help eliminate all these issues as you will have a trump card that you can call their bluff when threats of escalation. Recently when our team implemented a social intranet we had the CMO, SVP of HR and CTO as executive sponsors. This won’t prevent threats or obstacles from being presented but will give you the confidence that it won’t go any further and the project will continue moving forward with the strategy you have set forward. And this helps team motivation. All any employee wants is to be able to complete their task and have success. Keeping a team motivated is really just this simple. If you, as the strategic leader, can secure the executive support to help remove obstacles and lay a foundation for the teams success that is all the motivation they will need. It is just the belief that success is possible and the team can do the work that they have been tasked with. These are just three reasons why executive support and leadership is important but realize that this doesn’t explain how to get an executives attention, tactics that can be used to eliminate escalations and keep the team focused on the end result. I think I just came up with three new chapters. Stay tuned and I’ll try to put some of these down in future posts. It was everyone’s commitment to the project that got us to the actual cutover day. But it was our resilience and sense of purpose that helped us persevere the next three days that would prove to be the most difficult challenge we would face to date. The Friday prior to launch, the database migration was on track and confidence was high we would be able to access the new Social Intranet production site on Saturday morning. And at 8am Saturday it was confirmed, the database migration had completed and we were ready to start our changes. By 7pm, we felt like we were at a good stopping and that the IT team could kick off the search index rebuild that would take approximately 16 hours. This is where the challenges began…. At 5:30am on Sunday, the search index process appeared to be hung at 97%. Rather than confirm with the vendor or project team, a unilateral decision was made to restart the service and start all over again. This was one of the first mistakes we made as a team and can’t help but think that a lack of sleep over the prior three days had something to do with it. Around 11am the search index was back up to 94% and the vendor confirmed this was typical as the process slows down the closer it gets to finishing and isn’t uncommon for several hours to pass between 97%, 98%, 99%… In hindsight if we had let the process continue, it would have been completed by this time. But, we pushed on realizing we couldn’t change anything at this point and we were well beyond the point of no return. By 3pm that Sunday, It was time to get out of the command center, get some fresh air and new perspective on status and moral. It was a beautiful sunny day and we talked about how we felt and where we were in the upgrade process. Morale was surprisingly high. There was still more to do but everyone felt we were continuing to make progress and nothing that would prevent us from completing our goal. Most of the old intranet pages had been moved over, all 500+ communities had been updated with the new layout, widgets and template, home page content was being populated and the training space was all setup and ready to go. All the work we had been doing over the last 48 hours, including uploading images, formatting spaces and organizing content had all been completed against Node1 of the four-node cluster. So, when the site came up our beautiful baby turned into an ugly monster that was out of control. The nodes hadn’t been synchronized which resulted in missing images, broken links and an inconsistent experience. By the time we realized it, user questions started rolling in from the Australia offices. “Why can’t I access this link?”, “Why is the home page missing images?”. We fielded as many questions as possible and tried explain and use this as a test the experience and it was immediately clear it wasn’t good. It is about midnight now and knew EMEA would be coming on-line in a few hours. The experience was terrible, the search index wasn’t complete and there wasn’t much we could do other than let process finish, cycle the servers, clear the cache and keep our fingers crossed. The site was a disaster and quickly realized we needed a maintenance page that would prevent users from accessing the site. This would also give the team a few hours of sleep and let the index process complete. The UX team said they could modify the entire theme with a maintenance message and would quickly test. We agreed and got to work. By 1am, the maintenance theme was live. It wasn’t pretty but it would do the trick and we agreed to meet at 5am and reassess where we were. This was a critical point in our go live preparation. Everything depended on the search index process completing. Everyone was tired, mistakes were made but we still believed we could get through this and the reward of delivering the experience was still in sight. Have you experienced any particular challenges where you persevered and resulted in a positive outcome?